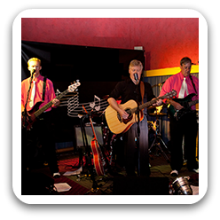 Sydney Band 429 is a Sydney based 50’s and 60’s Rock’nRoll style band that specialise in providing quality entertainment for any occassion focusing on the classics from the Golden Rock’n’Roll era. Made up with only experienced and professional musicians, Sydney Band 429 consists of Drums, Lead guitar, Bass & Lead Vocal with rhythm guitar and optional keyboards. All musicians share a passion for performing at a high standard and backed with loads of experience Sydney Band 429 will deliver unrivaled performance and presentation tailored for any occasion or event. The band provides its own P.A and lighting for any type of venue. Can perform as a: 4 and 5 Piece Band and are available to perform in Sydney and Surrounding Areas. Band 429 were great. I had a party in the country and these musicians had everyone up dancing. Every number was good. The band arrived on time and gave us plenty of music. They were nice people and easy to deal with. I would thoroughly recommend them to anyone looking for a dance band doing great songs of the 50s 60s and later. We booked the band for a garden party day time in Dec15. The band arrived and set up with plenty of time to spare. They played an awesome mix of music, which got the party started and set the scene. It wasn’t long before the party goers were up dancing, grooving and jiving until the last song. Everyone commented that the band was great, and the guys were professional, dressed the part and were really easy to deal with. Highly recommended!